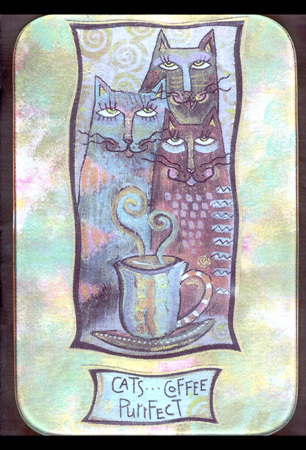 Cats, Coffee, Purrfect glass tray - Glass Tray 8" X 12"
Mary's art accents this 8" by 12" glass tray with the "Cats, Coffee, Purrfect" design. Tray can be used as a serving dish for cheeses, breads, sushi or pastries. Also purrfect as a hot plate or cutting board. Durable, sanitary, and dishwasher safe. Rubber feet for stability. A "catty accent" for the discerning chef.